published twice a year, each issue will contain written and visual contributions from discerning individuals around the globe. 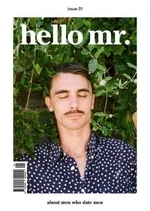 an inclusive and informal approach that makes hello mr. something you can’t help wanting to get to know. and given we uphold the following simple attributes, we hope hello mr. is something you can’t help knowing you’re already a part of.